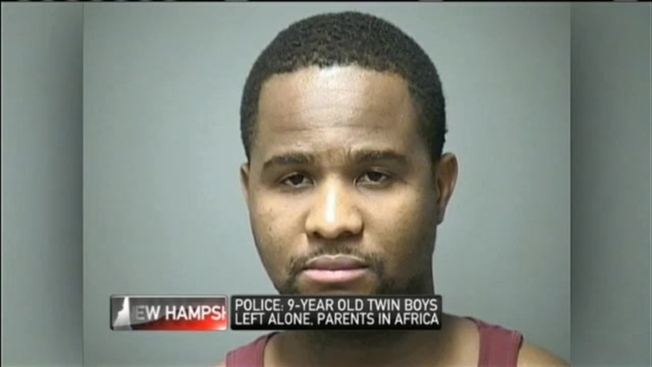 A New Hampshire man agreed to watch over twin 9-year-old boys while their parents were in Africa, but left them mostly alone for four and a half months, authorities said. Giobari Atura, 25, of Manchester, the boys' uncle, is free on $500 personal recognizance bail and faces charges for endangering the welfare of a child. Police said they found no edible food in the apartment, other than Ramen noodles, but the boys had managed to get themselves to school for several months. Police said Atura would stop by every few days while the boys’ parents were in Nigeria and drop off some food. The boys' parents went overseas in July. They were due to return in August but said illness and passport problems delayed them. According to court paperwork, police were alerted by the Division of Children Youth and Families on Nov. 5, when the twins told a social worker that they were taking care of themselves. School officials had alerted DCYF that the two boys had been living at the address for months while their parents were away in Africa. "I think the kids came to school without a jacket and in flip flops in early November," explained Assistant Hillsborough County Attorney Michael Valentine. The boys told the social worker that they would wake up for school on their own, get ready, get on the bus, and eat breakfast and lunch at school. "These kids were getting themselves out of the building, on the bus when they could, walking to school at other times, we are just really impressed with their resourcefulness," Valentine said. After initially failing to reach the boys' parents in Africa, they were taken into protective custody and subsequently placed into foster care. Neighbors say the boys are quiet, always well dressed, and clean, and so they didn't suspect anything was wrong. "I am guessing they two smart kids, you know, nine-year-olds taking care of each other," explained Keneth Lemite. Atura didn't answer his door and our calls to his lawyer have not yet been returned. Police say Atura admitted that he brought the twins food a few times a week and told them to call if they needed anything. But officials say there was no phone in their apartment. "That was a concern and part of the charge against him, their ability to contact someone including Atura if something went wrong, was a factor," Valentine said. "I have not seen nobody with them since I have known them here," explained Rosemitz Lemite who lives just down the hall. Valentine tells us the parents came home in mid November and won't face any charges because the children were left in the care of their uncle. "They did have conversations with the defendant and with the children and they were still under the impression that Atura was taking care of the kids," he said. Atura will face a court date within a few months.